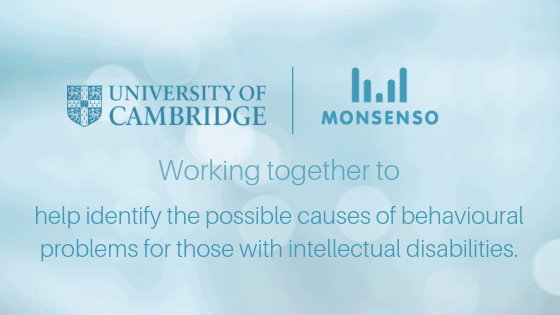 Monsenso has partnered with the University of Cambridge, Department of Psychiatry, to support the research of using mHealth to help identify the possible causes of behavioural problems for those with intellectual disabilities. The University plans to further their research and advance their understanding of behavioural problems in individuals with intellectual disabilities, which will initially include a group of people with Prader-Willi Syndrome. The study will be focusing on recording of information & data relating to their mental health state and try to elucidate the reasons for the behavioural problems. The Monsenso mHealth solution is used in a growing number of mental health innovation and research related studies. Monsenso is delighted to be working with Prof. Holland and team. The solution will be employed to monitor individuals and collect behavioural and physiological data via the smartphone delivered solution. The solution will collect daily self-assessment data, diary entries and record physiological measures, complemented by passive data collection by both the smartphone and wearable devices. This aim of the study is to use this data to determine the effectiveness of treatment on a number of physiological measures, and to compare physiological measures between groups of participants. Additionally, this study also wishes to see if this data can potentially identify triggers, or causes, of the behavioural problems of participants. In previous similar research studies, clinicians, nurses and researchers were also asked to collect data about the client’s mental state and outbursts. However, this data was pen-and-paper based, which was clearly vulnerable to inaccuracies, as it was dependent upon the nurse’s ability to remember and record the events as soon as they occurred. It was also difficult for these notes to provide a longitudinal picture of the client’s behaviour over time. Applience of the technological solutions is a massive advancement in how researchers utilise and collect research data in this complex setting. “Research is essential to find out which treatment and interventions work better for the patients and our mHealth solution can be used to enhance data collection and outcome measures that support this. Using this technology, Monsenso can help provide a detailed longitudinal overview about the individual’s mental state, which can help to identify signatures of behavioural patterns, and even forecast future conditions. We are proud to support the researchers of the University of Cambridge”, says Thomas Lethenborg, CEO of Monsenso. Sign-up to to receive our newsletter and download “MHealth – The future of mental healthcare” fact sheet. Copyright © 2018 Monsenso ApS. All rights reserved. A representative will be in contact with you right away. Thank you for your interest in Monsenso.